Beautiful Incentives: Make a perfect cup of tea anywhere or on the go. Make a perfect cup of tea anywhere or on the go. To me, there is little better than relaxing with a hot cup of tea in the morning on a cold day, before bed or after a long day. Decaffeinated or not, it still gives me pleasant relaxing feelings. Libre is a company that devotes themselves to helping people make tea very easily, safely, efficiently and as fast as possible. This glass tea infuser works two simple ways. You can enjoy libre with your favorite herbal or fruit infusions, hot or cold! I am a bit of a tea head, so I really enjoy trying out new products revolving around my thankfully healthy addiction. I have tried many ways to brew and steep my tea, but this is new to me so I am excited to see it in action and the designs are so pretty. 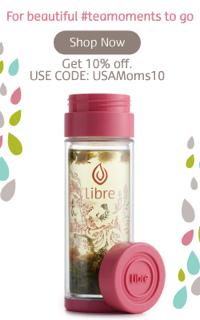 The Libre tea glass is a pretty and practical choice for convenient leaf tea 'on the go'. Its removable filter keeps all the leaves, or the bag, in the glass away from your mouth - great for fruits or soothing herbal elixirs. You can create your own flavorful beverage and enjoy. Wonderful herbal teas are a great way to wind down at the end of a long day. Our 'how to video' shows 3 ways to use and brew tea. The 100% BPA free, Libre tea glasses keep drinks hot or cold, are very durable and ensure a fresh taste every time due to their easy wash glass interior - its the only to go thermos you'll need at the soccer field, yoga class, on a hike, the morning dog walk or curled up on the couch. We love to inspire tea moments anywhere, anytime - take a sip, watch your tea leaves dance and enjoy relaxing tea moment for yourself. This holiday give your friends and family an inspired and unique gift you can use all year round. Choose from the Classic Collection - sophisticated metal trim with gold detailed lids, or our Libre Life Collection - bright, joyful patterns - and watch the leaves dance. There are great deals on 6pcs Holiday Gift Paks for all the tea lovers on your list. My readers get to save! Great for Holiday Gifts, Calm moments and Traveling!